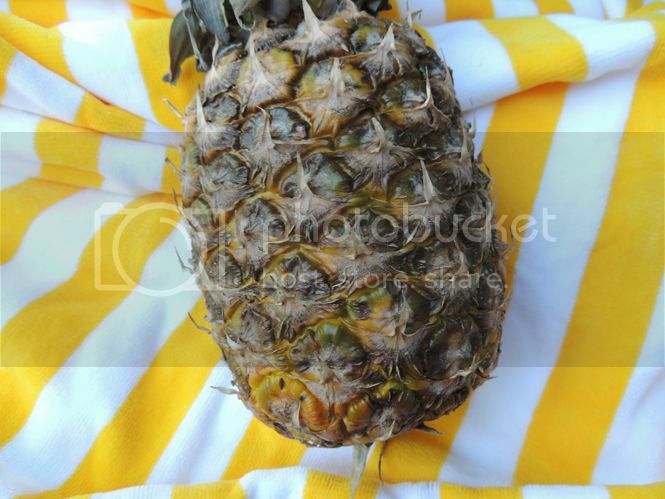 Daily Dose of Design: Get Ready, Get Obsessed: Pineapples Are Everywhere! Get Ready, Get Obsessed: Pineapples Are Everywhere! Out of all the trends there are lately, pineapples have to be my favorite! I'm beyond obsessed - my mom laughs at me every time I come home with a new pineapple something...or the best is when an order comes in the mail and it's all pineapple everything! ; ) They're just so cute and who wouldn't love something that stands tall with a crown? I've been fueling my obsession for a month or so now and just recently, the pineapple decor, clothing, etc. started popping up more and more everywhere I go. From cute tees to pool floats, I seem to be able to find them everywhere and I'm so not complaining! I love this colorful/watercolor pineapple case from Pura Vida and I mostly love that proceeds from purchases go to a good cause. When I saw this case, I knew I HAD to have it! And I love that it can double as a cosmetic case, wet clothes pouch, etc. 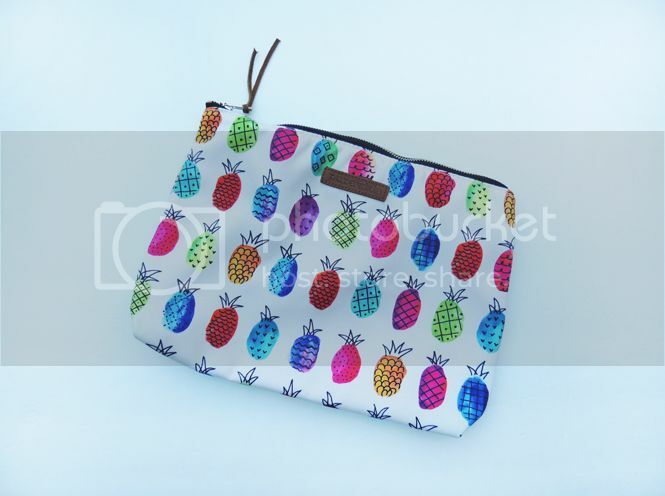 I mean, who could pass up a watercolor pineapple pouch? Can you even take how cute this tee is?! It comes in this white/gold tee and it also comes in a gray/white one! I'm absolutely obsessed and the boyfriend fit with a v-neck is my absolute favorite style, especially for summer. These pineapple pants are the comfiest pajama pants I own - I love this line of pants from Victoria's Secret and the color of these pants is too perfect! Basically what my suitcase looks like every time I pack! Do you love the pineapple trend? What's your favorite? I love it. 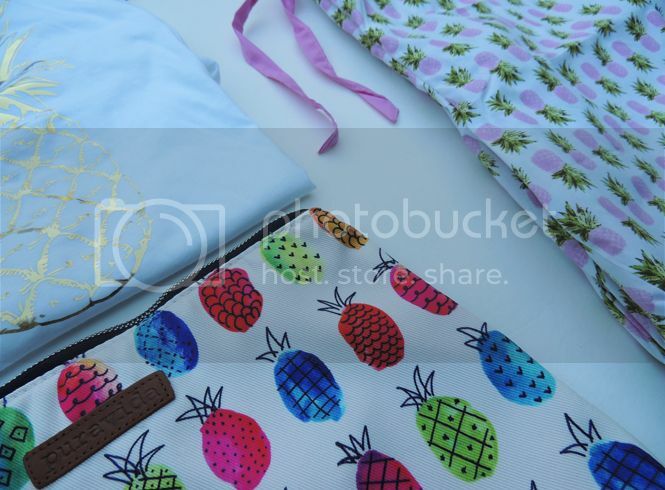 I am totally obsessed with fruit prints and pineapples are no exception. I think it's so summery and cute. I love pineapples! Especially this phone case and the cosmetics bag. Too cute!! I love it too! Those pjs are awesome. I just bought a pineapple doormat on clearance at target...I couldn't resist! I have that trinket dish and love it, but I NEED those socks in my life! these are all wonderful gift ideas for yourself or others: ) super cute, fun, and summertime look, love it! Love that little bag and who doesn't like pineapples. Ahhh!! I'm pineapple obsessed too! Love these all! I am seriously loving the pineapple trend! It is one of my favorites from recent years. The phone case is definitely my favorite! Love the case! I live in the land of pineapples and never get tired of them! So cute! I love the pineapple trend. I have a necklace I wear every day with it! 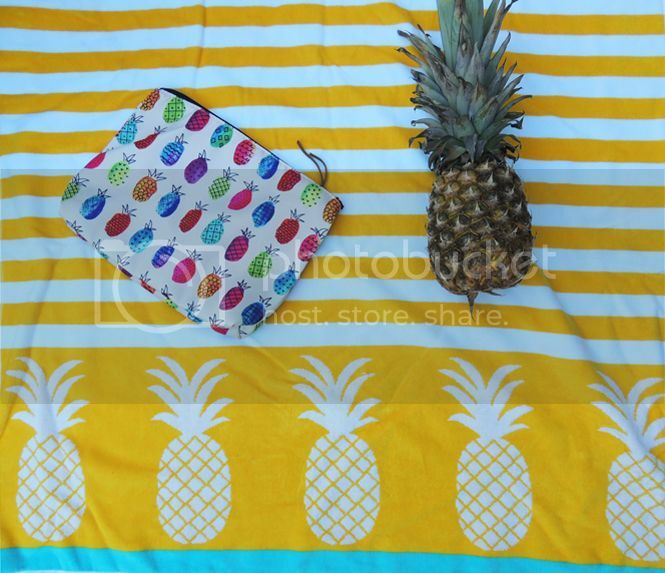 Pineapples are such a fun print right now. I love the watercolor case from Pura Vida, it's the cutest little thing. Love the pineapple trend! 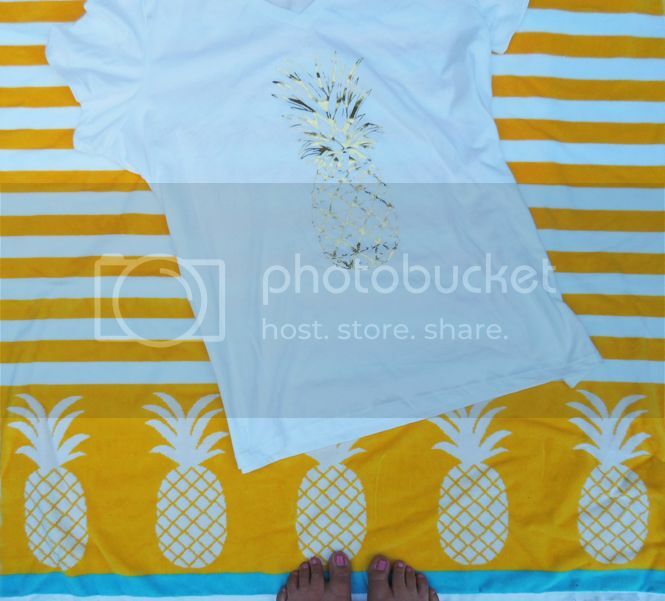 The iPhone case and the gold figurine are definitely my favs from your roundup along with the pineapple tee! How did I not know pineapples were trending?? Love the PJ's! Pineapples and birds...are everywhere! Admittedly I'm in love with both of them! :) Love these ideas! 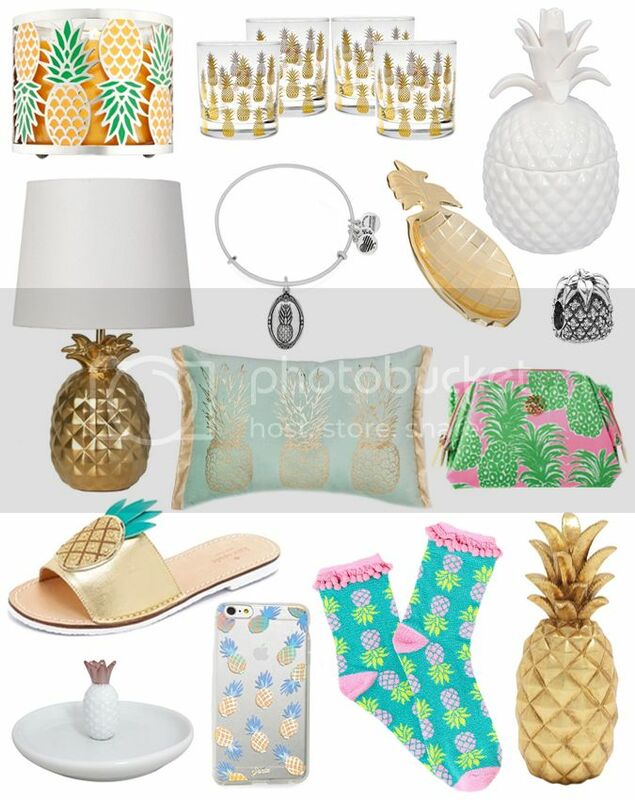 I'm a huge fan of pineapples in accessories, home decor, etc. Those pineapple socks are sooo cute! I'll be on the lookout for them! Thanks for the inspiration. I love this pineapple trend! So many great pieces! I love to eat pineapples, but never really thought about decorating my house with them. I think if you have a tropical feeling the home it would look wonderful. They are everywhere! I saw a pineapple phone case at Nordstrom Rack yesterday that I almost bought! Totally Pineapple-obsessed and loving these!!! Cute! Those pineapple t-shirts are my favorite!! So perfect for summer! I LOVE your pineapple pajama pants!!! My sister absolutely adores the pineapple trend! I'm going to have to show her this post - those little pineapple tumblers are just too cute. I am loving the pineapple trend! It's so cute! 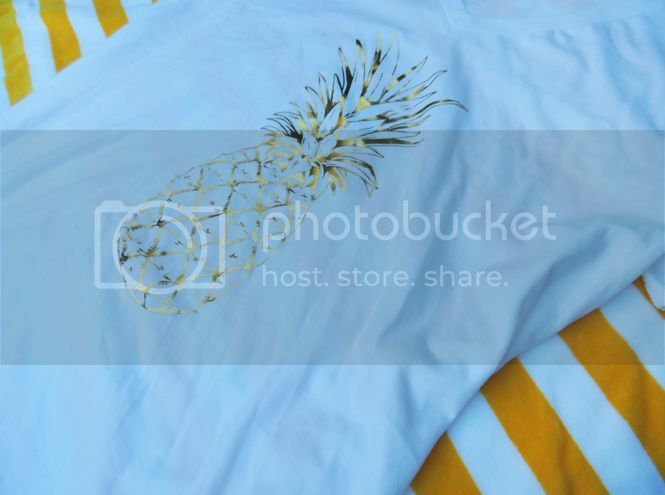 I love the tee with the gold pineapple on it! Oh my goodness that is such cute stuff. Anything pineapple is so fun for summer. 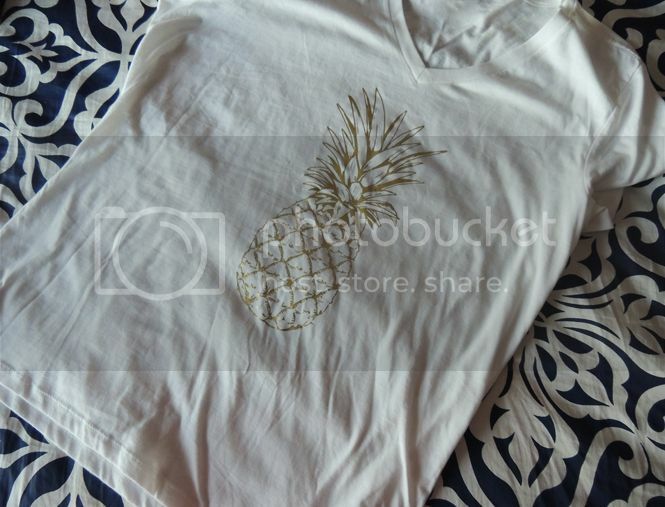 And I love the gold foil pineapple shirt. I would want to wear it everyday too! Those PJ pants are too CUTE!!! I think the pineapple trend is absolutely adorable. Loving the pajamas. They are just too cute. I love this! I think I need the iphone case and the pj's are so ridiculously cute. I actually have a pineapple lamp from the 70's! That is adorable, loving all of those pineapple themes! I have definitely noticed the pineapple trend and i was wondering why theyre so popular, now i know. Theyre so cute and tasty! Pineapples are definitely everywhere nowadays! My gf got the cutest chip and dip bowl that was a pineapple shape and I just fell in love with it at her last party. Now I'm on the hunt for it! Loving the pineapple trend. I started noticing pineapples pop up last summer. Love it! 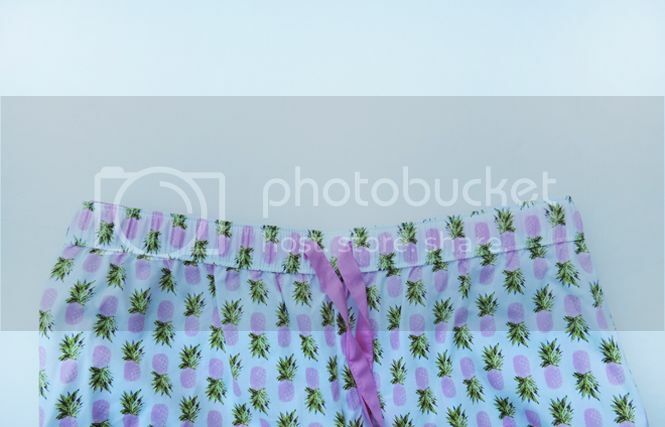 Love the pineapple PJs. I am super into the pineapple trend and palm tree too. Pineapple anything is a winner in my book!! I saw pineapples everywhere at Target a few weeks ago. I'm dying to grab a few for some home decor. These are all so cute! These are some really cute pineapple items for sure. I love these t-shirts and the pineapple lamp. Pineapples remind me of summer time and I will have to check these out. Thanks for sharing these items. This pineapple trend is so so cute! I am in love with the candles you found. I love the pineapple craze!! They are one of my favorite fruits, so obviously, I love pineapples, ha! That tumbler set is just too cute. I'm going to have to put those on my wish list. I love pineapples! All of these are so cute!! I've totally noticed the pineapple trend for sure. My daughter is all into it, I've gotten her earrings and several shirts so far. It is such a cute trend, I need to get me something. I was just at Target and noticed all of the pineapple themed stuff. I love it! I love this trend also!!!! I am also loving the flamingo trend! I love the PJs and the t-shirt too! I love this pineapple trend!! Those socks are too cute! I really like the pineapple thing that's goin on. I really get attracted to simple designs, which is why I think the pineapple works well. It makes you think of summer and sunshine but it isn't too girly or random. So fun! I love the pineapple trend! I just recently bought a gold pineapple candle from target to add to my collection! So many cute things! I'm loving this pineapple trend! The pineapple trend definitely is everywhere! Love everything you picked out! I'm totaly obssesed with pineapples too. I also have that phone case, and just picked up a cute tee from the LOFT and bought earrings from Le TOte that are pineapples too.